West Java is a province in Java Island with indigenous tribes Sundanese. 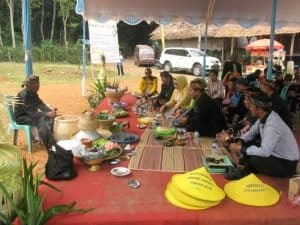 Sundanese tribe has a distinctive culture, which Sundanese culture has a very strong attraction for the tourists who visit the Sunda tribal region. Sundanese also have some arts and culture that exist in West Java. Sundanese are also very active in preserving their culture. In fact, they still carry out some traditional ceremonies held every year. Here is the list of traditional ceremony in West Java you must know. This is a purification ceremony of sacred objects. The people will wash their sacred objects such as keris, sharp weapon, or sword. 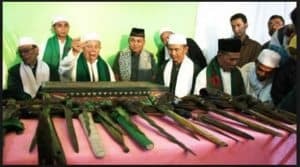 Those sacred objects or heirlooms were a symbol of Sunan Rohmat Kudus’ struggle to fight for Islam while he was alive. Usually, the ceremony is performed by a caretaker or kuncen (the village elders). It aims to prove that they still preserve the tradition of the ancestors as well as inform the public about the existence of the heritage of Sunan Rochmat Suci. This ceremony is usually done in Garut. Ngunjung / munjung come from the word of berkunjung (visit), which is visiting and praying in the grave of ancestors or parents, as a manifestation of gratitude society. This ngunjung / munjung ceremony includes traditional ceremony of West Java which is usually done by people in Indramayu, Cirebon, and surrounding area. The location of this traditional ceremony is usually in the graves of ancestors and religious leaders who are respected and trusted sacred. The purpose of this ceremony is to preserve the culture and ask for salvation. The ceremony is usually held in Syuro and Mulud or after the rice harvest. In addition, the ngunjung ceremony also features typical art, such as puppets and in some places featuring theatrical art. In this ngunjung ceremony people usually flocked to bring rice cone and other traditional foods. 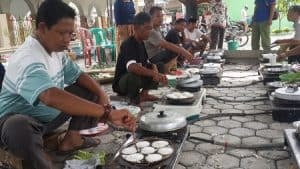 Bubur Syura has nothing to do with Ashura, or the remembrance anniversary of the death of Imam Hussein, the grandson of the Prophet Muhammad, in the event at Karbala. The ceremony which held by the people of Cirebon on every 10 Muharram is associated with the events of Nuh (Noah). However, in practice also associated with the Goddess of Fertility, namely Nyi Pohaci Sanghyang Sri. The community believes that this traditional ceremony can bring prosperity and peacefulness. The location can be performed outside the home of one of the citizens who are believed to perform the ceremony. Sometimes the ceremony is held on the river bank, in the field, or at other locations determined by the ceremonies. There are various budgets to carry it out, and various equipment, such as offerings, sacred objects, art, porridge equipment, and of course the location of the ceremony. Ngapem comes from the word of apem, which is a cake made from rice flour which is given yeast which is generally eaten by dipping it first on the water of coconut milk called kinca. This ngapem event is a kind of gratitude for avoiding the reinforcements during the month of Sapar. The symbolic message we can learn from this ritual is that the apem cake symbolizes the human and the kinca symbolizes blood. So when the apem cake dipped on the kinca in essence to remind us that we must be introspective because we could be hit by a disaster, which in this case drowned in the puddle kinca (blood). Another customary ceremony in West Java is Ngirab or Rebo Wekasan. The people who live in the River of Drajat area, Cirebon, used to perform this ceremony. The ceremony is marked by a pilgrimage to the the tomb of Sunan Kalijaga, which was performed on Wednesday of the last week of Shafar. This time is taken because it is considered as the best day to eliminate reinforcements and misfortune of life. Rowing races are usually performed after the ceremony ends. By using their boats to keep watch and to bathe in a place where Sunan used to watch the bath. This custom is called “Ngirab” which means to move or move something to remove the dirty. 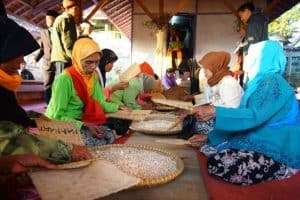 Seren Taun is a traditional Sundanese rice harvest ceremony conducted every year. 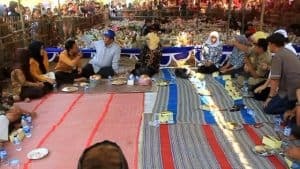 The ceremony was very crowded and attended by thousands of surrounding communities in various villages in the Sunda region. Not only from the surrounding areas, but also people from various regions and foreign tourists come to witness the ceremony. Seren Taun traditional ceremony is said to have been done in descending since the days of ancient Sunda Kingdom such as Pajajaran kingdom. Seren Taun comes from the Sundanese word, ” Seren ” which means Serah, Seserahan (handed over) and ” Taun ” which means Year. So Seren Taun means a handover from last year to the next year. It can also be interpreted as the part of the community’s gratitude to God Almighty for all the agricultural produce that they get. 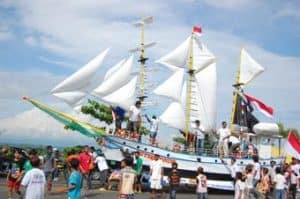 The Pesta Laut is usually held in West Java area such as Pelabuhan Ratu (Sukabumi) and Pangandaran (Ciamis). 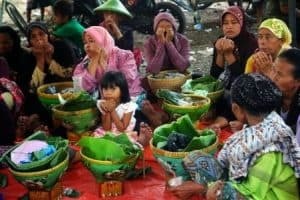 This ceremony is a form of gratitude to Allah SWT over all the sea products obtained by the fishermen, also referred to as a request for safety so that the fishermen are always given salvation and abundant seafood. In the ceremony the fishing boats were decorated with various colorful ornaments that fishermen climbed up and were given offerings on it. What is unique in this event is that the fishermen award the buffalo head that has been wrapped in white cloth to the ruler of the sea as a repellent of reinforcements. This Sea Party is held once a year. And become one of tourism attraction for society. Nadran ceremony is a traditional ceremony of a sea charity that usually done in Karawang. Nadran comes from the Arabic word “nadar” which means thanksgiving. The purpose of the nadran ceremony is as an expression of the gratitude of the fisherman to God for the results of the fish he obtained, begging for the future to produce more. 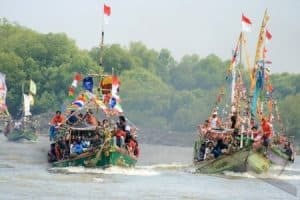 Besides this ceremony to honor the ancestors who are considered as the forerunner of a fish in the sea called Bedug Basu, is considered as a figure which trusted the people of Sungaibuntu as the forerunner of fish. In addition, the ceremony is also functioned to ask for salvation, so that fishermen avoid the disturbance of evil spirits. At this ceremony is usually held performances Wayang kulit who took the play Bedug Basu (Rajanya Ikan), but it also held a theatrical art that took local folklore. Nadran ceremony at Sungaibuntu is usually done in June for two weeks. 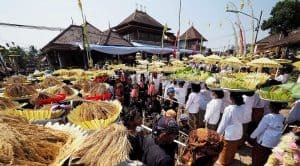 Ruwatan Bumi is a tradition of traditional ceremony of the community as an expression of gratitude towards God Almighty over the abundant agricultural crops as well as the repellent ritual ceremony as well as respect for the ancestors who contributed to a region. Ruwatan itself comes from the word “ruwat” or in the Sundanese “ngarawat” which means taking care or keeping while the earth contains the meaning of where we live. Another word of the ruwatan of the earth means keeping our place alive. Implementation of Ruwatan Bumi is usually done before farmers start farming or before farming starts. Before the holding of the Ruwatan Bumi, the farmers are expected not to work on his farm. If one of the farmers who violates the tradition, it will be hit by misfortune for farmers. It can be the pest farming or decreasing crops so losers. Ngalaksa is one of the Sundanese culture associated with agriculture. This ceremony can usually be found in the area of Ranca Kalong, Sumedang who still perform this ceremony. Ngalaksa ceremony is done by bringing rice to the barn. Rice is carried with long bamboo perforated called the rengkong. At a glance, the ceremony is almost the same as the traditional ceremony Seren Taun. Ngalaksa ceremony is usually done every June. One of the interesting things about this traditional ceremony is the sound of music that has the same rhythm with the steps of people – people who walk that is from the rocked rengkong. In addition, to complete the ceremony is also held Tarawangsa art for a week. Gusaran: Gusaran ceremony is flattening a girl’s teeth with a special tool. The goal is that the girl’s teeth are flat look more beautiful. The Rotting Ceremony is performed when the girl is seven years old. Sepitan: Sepitan ceremony is a sunda term for circumcision / circumcision event. This is in accordance with the Islamic Shari’a, where boys are obliged in circumcision. The goal is to keep the vital tool clean and does not contain urine sewage. Tingkeban: Tingkeban ceremony is a ceremony held when a mother contains 7 months. This ceremony is intended as a form of pleading for the safety of the baby and the mother giving birth. Marhabaan: The marhabaan ceremony is meant to cleanse or purify the baby’s hair of all kinds of unclean. The shaving ceremony is performed when the baby is 40 days old. Nenjrag Bumi: The Nenjrag Bumi ceremony is a ritual puncture to the earth seven times near the baby, or another way that the baby is laid on a mud (the floor of the split bamboo), and then the mother stomps her feet to the lily near the baby. Those are the traditional ceremonies in West Java. Hopefully, these traditional ceremonies still be exist and may the grandchildren be the heirs of the culture.